Tales of a Land Army Girl by Market Harborough Movie Makers got a 4-Stars awards at BIAFF 2009 . Colin Sullivan tells us about the club's new local hit. 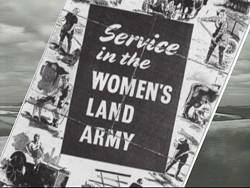 When local lady Pat Fox gave some notes of her wartime life in the Womens Land Army to a member of our local historical society she could not have imagined what she had let herself in for. The document soon got into the hands of Len Holden and myself, both members of Market Harborough Movie Makers and the idea was formed. We contacted Pat, now in her eighties, and to our delight she had no hesitation and wanted to be involved with whatever we were going to do. 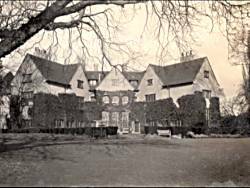 We read her manuscript and selected from it the parts that we considered we could make into a film and, as is the way in our club, we selected items that would be of interest to local people. We have good audiences for our films (over 1000 every year) and we believe the reason for this is because people are able to see themselves, their friends and their locality on the big screen. We set about writing a draft script, but it soon became obvious that it would need a lot of Pat Fox on the screen to tell her story. We have a habit of doing this and always agonise through the planning process as to whether they will do the job satisfactorily on camera. So far we have not been let down and of course our Land Army girl was to prove no exception. In fact anybody who has seen the film will have recognised a star. Our shooting team consisted of cameraman (yours truly), script man (Len Holden) and sound and lighting (Peter Wilford). Before starting we had checked out most of the locations, some being left to Pat (obtaining favours from her many friends in the area). The script identified the stories we needed to film at each location. We could not, of course, write the words for Pat to say, so in many places the script was simply tell about the Prisoners of War or tell us about haymaking. At the beginning this was accompanied by a big prayer that she would tell it in a way we could use. Why should we have worried? 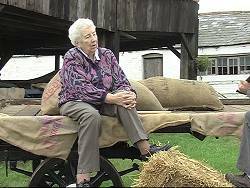 On the first shoot with Pat we set up in her friends farmyard, used his old cart, his muck heap and anything else we needed and said tell us about threshing and off she went. Most scenes were done in one take and if two were needed it was usually our fault and not hers. We have made a few films like this one, where we sit somebody down and ask them a tell us about question with mostly successful results. I suppose as a group we must have a way of relaxing them and making them feel comfortable. We talk to them before the shoot if we can and get them talking freely to us before the camera goes on, but our best trick is probably that we always seem to be talking to people about their pet subject. They are then so pleased that we are interested enough in their subject to make a film about it that they chat away to the guy standing next to the camera, like an old friend. Our kit for this film was my Panasonic GS 400 camera (always on a tripod) with a boom mounted Rode NTG-2 shotgun microphone (Peters arm and shoulder muscles developed quite well during the summer). Lighting when we were inside was a pair of Unomat LX301Z 300 watts quartz halogen lamps (bought for us by a very grateful local company whose history we told on film the year before). The filming progressed with Pat at various locations, many of which were of interest in themselves to our local audiences. The remains of the villages railway station, axed by Beeching, the site of the long demolished Edwin Lutyens mansion, the site of the Land Army Hostel that the girls all lived in, and the site of the towns PoW camp. 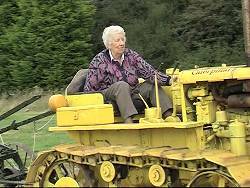 Pat had told us that she drove tractors during the war and was particularly proud of learning to drive a Caterpillar tractor. 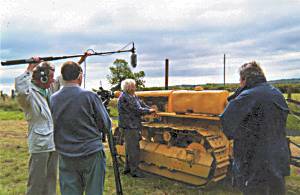 When we found that one of her wartime friends still had the same model tractor, in good working order, there was no question that we had to film that. The shoot was set up and sixty years on Pat drove the machine up and down the field for the camera, just like the old days. 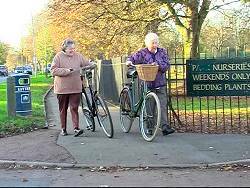 For one scene we needed two authentic wartime bicycles and in a couple of phone calls we found a collector who was only too pleased to give his bikes an outing and join us on a shoot. 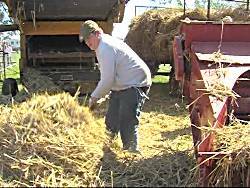 The owner of a threshing machine was just as helpful, allowing me to clamber onto the top of the machine with camera and tripod. More cases of talking to people and showing an interest in their pet subject. It goes without saying that we thoroughly enjoyed our summers filming. The post production was all about finding the stills to illustrate these great stories. Although we were lucky enough to have some local wartime footage in our club archives, you cannot usually find film material when making a history film and stills become a necessity. I used many of Pats photos that she had taken during the war but many had to be sourced from books about the Land Army and then began the process of obtaining permission to use them. Our script editor (Len Holden) also doubles up as a very good voiceover artist and this I find so important if you want to hold an audiences attention in the longer films. As is the music, and on this film we were very lucky to have this written and performed for us by a friend of our club. The story began to take shape in the editing suite and after many months, the day came when I decided enough was enough and then, apart from starting on the next project, we could all enjoy showing the finished film to our local audiences. This one is proving to be one of our most popular, which is reward enough, but for it to gain a Four Star award at BIAFF, with our first entry into the competition, is the just icing on the cake.